As promised in the last newsletter, our big restocking order from China has arrived. As usual, not everything ordered was available, but a lot of your out-of-stock favorites have returned. We'll have some neat new models in the coming weeks, as I have a chance to photograph them and set up new webpages. Rather than try and cram all the returning pens into this newsletter, I've temporarily set them up on the homepage for your easy perusal. They'll be marked 'back in stock' next to their hyperlink, and underneath a reference photo -- as with the Pearl Windows model below. 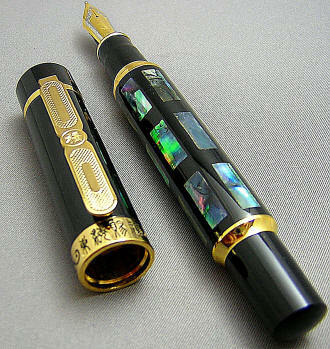 An organizational note: I've moved the Duke and Uranus brands, underneath the 'Chinese pens' link -- where they belong! Join us on our Facebook fan page. Facebook has recently simplified addressing for business pages, so we can now be reached directly at www.facebook.com/hisnibs1. So.....when are you going to do a new video for HisNibs.com?